FILE - An icon for the Twitter app is seen on an iPhone screen in New York. Struggling social media platforms Twitter and Snapchat are taking on new looks as the services seek wider audiences in the shadow of Facebook. Twitter has said that 9 percent of tweets written in English hit the 140-character limit. People ended up spending more time editing tweets or didn't send them out at all. By removing that hurdle, Twitter is hoping people will tweet more, drawing more users in. Waking up to the news Wednesday, Germany's justice ministry wrote that it can now tweet about legislation concerning the transfer of oversight responsibilities for beef labeling. Munich police, meanwhile, said that "at last'' they won't need abbreviations to tweet about accidents involving forklift drivers, or Niederflurfoerderfahrzeugfuehrer. FILE - A billboard displays the logo of Snapchat above Times Square in New York. Snap, Snapchat's parent company, did not provide details on the upcoming changes. His comments came on a conference call with industry analysts after the company posted the lackluster user-growth numbers and revenue that fell well short of Wall Street expectations. Snap's stock was bludgeoned Wednesday, falling 16 percent to $12.70 in early-morning trading. The Venice, California, company went public in March at $17 a share. Snapchat needs to grow its user base beyond 13-to-34-year-olds in the U.S., France, the U.K. and Australia, Spiegel said. This, he said, includes Android users, people older than 34 and what he called "rest of world'' markets. 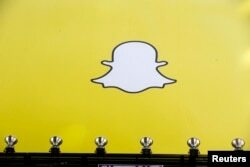 Meanwhile, Snap said Wednesday that Chinese internet company Tencent had acquired a 10 percent stake in the company. Tencent runs the WeChat messaging app, as well as online payment platforms and games. Earlier this year, Tencent bought a 5 percent stake in Tesla Inc.
As for Twitter, the move to 280 characters was begun as a test in September. "People in the experiment told us that a higher character limit made them feel more satisfied with how they expressed themselves on Twitter, their ability to find good content, and Twitter overall,'' said project manager Aliza Rosen in a blog post. The company has been slowly easing restrictions to let people cram more characters into a tweet. It stopped counting polls, photos, videos and other things toward the limit. Even before it did so, users found creative ways to get around the limit. These include multipart tweets and screenshots of blocks of text. Twitter's character limit was created so that tweets could fit into a single text message, back when many people were using texts to receive tweets. But now, most people use Twitter through its mobile app; the 140-character limit is no longer a technical constraint but nostalgia.